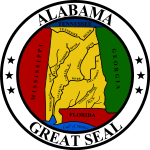 The 1964 United States presidential election in Alabama was held on November 3, 1964. Alabama voters chose ten representatives, or electors to the Electoral College, who voted for President and Vice-President. However, in Alabama, the May 5, 1964 primary chose a set of unpledged Democratic electors,  by a margin of five-to-one,  whilst Governor George Wallace refused totally President Johnson's civil rights and desegregation legislation via the Civil Rights Act of 1964. Unlike in Mississippi with the MFDP, no effort to challenge this Wallace-sponsored slate with one loyal to the national party was attempted. Consequently, Johnson would become the third winning president-elect to not appear on the ballot in Alabama, following on from Abraham Lincoln in 1860 and Harry S. Truman in 1948. Under Wallace's guidance the Alabama Democratic Party placed this slate of unpledged Democratic electors on the ballot,   against the advice of some legal scholars,  but after planning to run for president himself (as he would do in 1968) decided against this in July. As of the 2016 presidential election [update], this is the last election in which Sumter County, Greene County, Wilcox County, Lowndes County, and Bullock County voted for the Republican candidate, as well as the last time that Macon County did not vote for the national Democratic candidate. This was the third occasion when a Republican nominee carried Alabama, but the first outside of Reconstruction elections in 1868 and 1872, when Ulysses S. Grant carried the state. Despite Johnson's landslide victory that year, winning 61.1 percent of the popular vote, the highest percentage to date, he also lost to Goldwater in four other previously solidly Democratic Southern states – Louisiana, Mississippi, South Carolina and Georgia. ^ "Alabama Expected To Choose Electors Backed by Wallace". The New York Times. 1964-05-03. ISSN 0362-4331. Retrieved 2017-12-09. ^ Denton, Herbert H. (October 21, 1964). "Flowers Attacks Wallace Democrats". The Harvard Crimson. Retrieved 2017-12-09. ^ "Unpledged Votes Are Held Illegal". The New York Times. 1964-06-14. ISSN 0362-4331. Retrieved 2017-12-09. ^ Lubell, Samuel (October 13, 1964). "Medicare Vote Hurt Goldwater". The Pittsburgh Press. Retrieved December 9, 2017. ^ "1964 Presidential Election Statistics". Dave Leip's Atlas of U.S. Presidential Elections. Retrieved 2018-03-05.